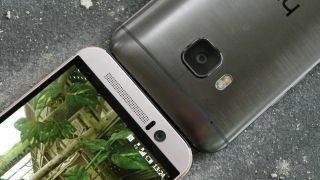 HTC is heavily rumoured to be creating a budget version of the HTC One M9, with some slightly less impressive specs paired with a more appealing price tag. Photos of the new phone have already begun to leak. The most recent shows it side by side with the iPhone 6, and it looks quite similar. Size-wise it's much the same, with rounded corners much like the iPhone 6's, and those white lines going across the handset. The camera has been moved into the center of the phone and looks similar to the duo-camera on the HTC One M8, but without the primary sensor undernearth. We don't currently know anything about specs and it's not even certain that the phone is going to see the light of day, but it could make some HTC fans happy if it's priced properly. Our review of the HTC One M9.